The Lord Gives Information about His Millennium Reign!. Portrayals That God’s People Need To Understand! Manchild - Window of Time! Portrayals That God’s People Need To Understand. C. What Will Happen once the Portrayal is Performed? 16 The heaven, even the heavens, are the LORD's: but the earth has He given to the children of men. (Ezekiel 4) Another portrayal known by some is when Ezekiel was told to make an image (symbolism) of Jerusalem and set an iron pan, symbolizing a wall of Iron between Ezekiel and the city. God had Ezekiel lay on both of his sides for the iniquities of the people. Symbolisms and images coming from the instruction of God are very important in any portrayal having to do with the Kingdom of God. Like Abraham, Ezekiel believed “God is” and his obedient portrayal “brought his faith alive,” producing results for the Kingdom of God. Again, few people in the world knew all that really happened concerning Ezekiel. (The portrayal was a revealing to humanity and as God said, “This shall be a sign to the house of Israel.”) The following portrayals are all signs to God’s people and to all of humanity. Of the then known world, few really knew what God was doing concerning these portrayals of Ezekiel and Abraham, which moved heaven. This reminds me of when the Lord told me that people would pass the Spotless Bride on the street and not know it. People passed Jesus on the streets of life and didn’t know who He really was. I used to believe the main characters in the Bible were super spiritual people. I came to understand differently when the Lord said to me, “Ezekiel was just a man like you before I entered His Life. They were simply men like Abraham and Ezekiel who believed “God is” and were chosen by God for a purpose. Do you know if you have been chosen by God for His purpose? Does God choose people for special purposes to day? Certainly. God says He changes not! When God called this group together He said He had a job for us to do. We didn’t realize until we had followed the Lord for some time that part of that job was portrayals. You will see this in the following. As stated on the Take His Heart site the Lord had us hold the first Marriage Feast of the Lamb some years ago. The Lord had us prepare the symbolism needed, which consisted of two pillars, a Chuppah, and a curtain, which was placed between the pillars. The Chuppah was hung overhead in front of the curtain. In the feast meeting we performed the acts (portrayal) that God instructed. After the main Marriage Feast meeting was over the Lord had us place a chair behind the curtain. In another meeting the Lord had us (as a group) pass through the curtain into where the chair was. We were just being obedient in the portrayals, not realizing what it was all about. We learned later that we were making a way (portraying) for Jesus to obtain a Spotless Bride in marriage and bring forth the correct Marriage Feast of the Lamb. The passing through the curtain was a portrayal making a way for us to learn how to do Golden Meetings and enter into the Lord in the present time, just as the priests did in the Holy of Holies. Looking back, the people who attended the Marriage Feast meeting believed “God is.” Our faith came alive in our obedience (portrayal) and produced results in the Kingdom of God. It’s the same thing that happened with Abraham and Ezekiel. Very few people knew anything had occurred that was of such a significant purpose! The Spotless Bride of Christ has manifested and is growing in the earth at this very moment, unknown to the general congregation and public. What God told me years ago about people passing the spotless Bride on the streets and not knowing it has already come to pass. If you have read about the First Marriage Feast of the Lamb meeting on the site you already know that God revealed the meeting was not done correctly, but that the meeting would still be accounted as the First Marriage Feast of the Lamb. The first meeting was simply a portrayal of things to come. The Lord brought the Holy Conclave up many times through different people in their individual Golden Meetings with the Lord. I share some times where He begins to give information concerning the meeting and what He will do. "Holy conclave coming / agenda (Circled tight.) "seek Me out / prepare the list / receive My target" Hands up in Praise & Adoration of JESUS. "grab it"
Preparation time is now. Things are coming together quickly. Again I say, Holy meeting coming forth. My glory and for My purposes. This is all to greater causes. My prophets, apostles and other joints of My body united as one in holy matrimony. Great things will occur. Stay ready and prepared. The devil stays lurking to destroy and devour. He shall not prevail. All are over-comers who trust in Me. Time of meeting approaching, many things will take place. Positioning, mantles, girded you will be and others as well. Holy time for My people. Preparations in the heavenlies ongoing. My army is at watch around the clock; no breaks needed. Be prepared for this event and stay ready for the call. All will be taken care of My son. I love you. Anticipation on my part was great as I knew the people the Lord was instructing to be in the meeting had learned Golden Meetings and spiritual warfare using instruction from the Lord. These people were scattered over the central and eastern part of the USA. They were all coming to join us here at the Lord’s command. I can not begin to share all the things God did for eight days in these meetings. That is not the purpose of this writing. Little did anyone know the purpose until the Lord’s proper time of revealing. I’m glad we didn’t know. To give some background, two weeks before the meeting was to take place the Lord revealed to me to replace the windows in the front of my house. I figured He wanted it done because the windows were in really bad shape and old. I didn’t think I had time, knowing some of what needed to be done before the meeting. It was not a smooth thing getting started because we had some trouble finding the window combination that would fit. The windows were in the living room of the house where the invisible laver was. We walked through the temple setting as we did Golden Meetings (as a group of 15) with the Lord in charge. It was an awesome time with the Lord. Near the end of the Conclave Meeting the Lord revealed the true purpose of the new windows. We didn’t know it, but we had all been involved in a portrayal of significant importance in the Kingdom of God. On the 27th of September I had a vision, seeing the windows coming up out of the ground along with a Laver that was waist high. 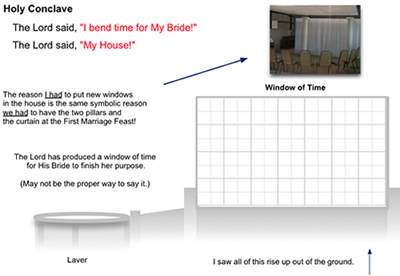 I was told, “I bend time for My Bride!” I knew from the scene that the Lord had produced a window of time for the Bride to be able to finish Her purposes in the Earth!” This is why the windows had to be new. I hope you can see this was a major element for the Lord to bring forth in the earth and His Kingdom. We had unknowingly portrayed what needed to be done to make the “bending of time” legal in the earth and in the courts of heaven. This was another portrayal produced by people believing “God is” and exercising their faith, making it come alive legally for God’s purposes. The Manchild is a major player in the book of Revelation, being produced through the Bride by Jesus. He is basically half Bride and half Jesus and will rule the nations with a rod of iron. We here at Take His Heart were suddenly faced with doing the portrayal needed to bring the manchild forth in the earth. So meet Kyle. The Lord sent him here some time back and the Lord had chosen Him to be the main character in the necessary portrayal. Kyle is a young man of faith who you will see parallels the faith of prophets in the Old Testament. The following are some things the Lord has revealed to him and others. The following information is in sequence. "Call forth My Called / line by line / bring them in / shoulder to shoulder / united front / truly united / announce the calling / rejoice / rejoice in the deluge / articulate truth / bear"
The Lord had Roy and Kyle stand back to back and call forth “the called,” from the four corners of the Earth! Are you in the called? Dream - I remember I was in a big room with high ceilings and there was a lot of space, and it was very open as well. I saw rows of chairs in this room as well that went back, but I never saw the end of them, or how far they actually went back. I remember seeing different people filling up these chairs, and Roy was in there as well. All of a sudden I noticed a big golden colored earth that was probably 6 ft in diameter and it was solid all the way through. I knew it was in the form of the earth because I could see the land masses on the surface of this big globe. This golden colored earth was flying around this room and would go up to different people and hover around them. I knew this golden colored earth was going to choose somebody. I knew this thing was checking people out when it came up close to them. Then this earth came up close to me on my left side, and it was right up next to me. Then it moved and started to hover right over my head, just above it in a stationary position. I knew it had chosen me. I then had to take the earth and hold it in my left hand while I drank this clear liquid out of a clear glass. I knew this drink had a pill that was also clear looking inside the glass. While drinking the liquid from the glass, it was sort of hard for me to do this and hold the earth in my hand at the same time. But I seemed to manage to do so. I knew after I drank this drink I would never be the same …. Holy of Holies – I have shown you great things / I have shown you My Judgment / it is so / never doubt My son / I have revealed, and it shall be so / be obedient to all I have commanded you / legal, legal, legal / portrayal / I change NOT / I love you / go in peace. Many things coming to pass / My Will is coming to pass / you please Me with your obedience / I am going to reward you greatly for this / what you are going to do must needs be / My Spirit will fly and take on those I have called / yes, who has power to retain the Spirit in the day of death. What Will Happen once the Portrayal is Performed? … Portrayal of the highest importance. I need all to participate. No hair like a baby (newborn). This will begin the outpouring of My Spirit. I will send out the call to all four corners of the earth. Time will be given for a response. Then the tribulation will begin. Woe to those who do not heed the call. So we see the portrayal needed to be done for the call Kyle and I performed on the 11 Dec 2013 to actually go out to the people in the world who are chosen by God. I think this a good place to explain that the Lord gave Kyle understanding that the anointing the Lord had put on him to be the portrayer of the manchild was the real thing and would go out from Him much like the anointing leaving Moses to go out to the seventy elders in Numbers 11:25. And the LORD came down in a cloud, and spoke to him, and took of the spirit that was on him, and gave it to the seventy elders: and it came to pass, that, when the spirit rested on them, they prophesied, and did not cease. One main prop to be made was of the earth. 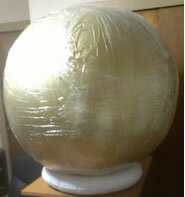 We purchased a three foot globe and the Lord instructed us to wrap it in cellophane. The cellophane represented the invisible Spirit of God that will cover the earth. Then the Lord showed that we were to paint the globe gold representing purification. After we accomplished this the Lord revealed to add another layer of cellophane representing a double portion of God’s Spirit going out over the world for His purposes concerning the Man-child! The prop was finished. It was revealed that Kyle was to wear a blood-red robe and hold the earth globe out in his left hand and drink sugar water (sweetness of truth) from a challis with the right hand as he did this. There were other details given concerning Kyle that I have not described here. I think it more important at this point to reveal what the Lord had Kyle perform in the portrayal. The Lord told us to do it in a Judgement Meeting; it was judgement by the Lord as you will see. We washed at the Laver. Went into Judgement Meeting: Sat for Portrayal. "Hear Ye, hear ye, you nations! The Spirit of the LORD cometh. It is now at hand. Who can withhold? No man. For it has been ordained by the Living GOD. The One who is, and was, and is to come. Kyle kneeled - got up. Got the clear glass goblet with sugar water in it & the scriptures. Stomped 7 times. "I will plow through you," says the LORD. "Who are you, O great mountain? You shall become a plain." Joel 2: 28 And it shall come to pass afterward, that I will pour out My spirit on all flesh; your sons and your daughters shall prophesy, your old men shall dream dreams, your young men shall see visions: 29 And also on My menservants and on My maidservants I will pour out My spirit in those days. 30 And I will show wonders in the heavens and in the earth: blood, and fire, and pillars of smoke. 31 The sun shall be turned into darkness, and the moon into blood, before the coming of the great and awesome day of the LORD. 32 And it shall come to pass, that whoever calls on the name of the LORD shall be saved. For in Mount Zion and in Jerusalem there shall be deliverance, as the LORD has said, among the remnant whom the LORD calls. Isaiah 26: 9 With my soul have I desired you in the night; yes, by my spirit within me I will seek you early; for when Your judgments are in the earth, the inhabitants of the world will learn righteousness. John 16: 7 Nevertheless I tell you the truth. It is to your advantage that I go away: for if I do not go away, the Helper will not come to you; but if I depart, I will send Him to you. 8 And when He has come, He will convict the world of sin, and of righteousness, and of judgment: 9 Of sin, because they do not believe in Me; 10 Of ?righteousness, because I go to My Father and you see Me no more; 11 Of judgment, because the ruler of this world is judged. "As surely as the LORD lives, all spoken here shall come to pass," says the LORD. He took the Golden Globe of the earth. The LORD told him to touch the top, bottom and both sides of it with both his left & his right hand. He then held the globe up with his left hand & drank all of the sugar water from the goblet. He put the glass down & kneeled, holding the globe out above his head. Then he stood up with the globe & set it aside. "It is done," says the LORD. "Mark this hour." The Lord told Kyle to tell the group to shout, "It is done!" It was 9:35 PM, CST, 18 Dec 2013. “All of heaven looks down upon you, never the same.” Clapped 7 times. All shouted, "It is done." The Lord said, "You may go." We returned to the Outer Court. The portrayal the Lord wanted was over. Awesome! The power was felt by those here and those participating in the meeting over the internet. Praise the Lord, we had completed another job affecting the Kingdom of God on Earth. Are you one of the called?